Not to be outdone by India's $35 tablet, the One Laptop Per Child (OLPC) organization has shared new details about its upcoming slate. Originally announced in 2009, the XO-3 is supposedly on track for release sometime early next year and will serve as budget computing solution for lesser-privileged children. When OLPC founder Nicholas Negroponte initially shared the concept, it was expected to cost less than $100. Although the organization hasn't settled on an exact figure yet, it still believes the sub-$100 bracket is feasible. Based on the latest information shared with PCWorld, the XO-3 will feature a protective rubber cover that could house an integrated solar panel, satellite Internet connectivity or an external hardware keyboard. The top of the slate's bezel will don a webcam, the bottom will carry a microphone and USB 2.0 ports, while a headphone jack will be on the side. Unsurprisingly, the device is expected to be powered by an ARM-based processor, though a specific chip isn't mentioned, and it will run Google's Android or Chrome OS. 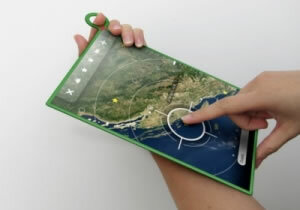 The interview revealed an interesting exchange between OLPC and Microsoft. In March 2009, the organization urged Microsoft to add support for ARM's microarchitecture to Windows. Redmond refused at the time, but during CES this year, the software giant announced that its next desktop OS, Windows 8, would be fully compatible with ARM processors. "Microsoft had to make that move. I told Craig Mundie he would have to do it in two years," Negroponte said. "He said 'absolutely no, never.' It was two years to the week." Apparently, the decision came too late as OLPC isn't interested in offering the XO-3 with Windows. The slate's development process is reportedly in limbo as the organization settles on a display technology. The organization wants to use a transflective screen (suitable for use in sunlight and other bright environments), except with richer visuals in e-ink and transmissive modes. A spin-off of Pixel Qi's hybrid screen is a likely candidate because it can operate in an both e-ink and normal LCD modes. The former would use ambient light to illuminate the display, thereby reducing the device's power consumption. Meanwhile, the latter mode would be less power-conscious, but ideal for watching full-motion video and other media formats.